This is the ProTek R/C P-8 1/8 Scale Buggy Super Hauler Bag. The P-8 Super Hauler Bag has evolved, and now features a variety of improvements that make the P-8 a durable, high quality, easier to use piece of luggage. These improvements include plastic interior framing and additional velcro surfaces that secure the shelves on the sides and rear, to prevent the shelves from sagging and causing the drawers to hang up when they are being pulled out or slid into position. Protective zipper tabs have been added to the front cover to help protect the zippers during transportation, and a solid velcro strip has been added to the entire length of the lower portion of the front cover to help keep the cover secured. When the cover is rolled up there are now five velcro tabs (instead of three), that will help to prevent the cover from coming loose when its rolled up. Finally, the graphic on the front features the ProTek R/C checkered flag graphic, with a ProTek R/C logo on the rear flap. 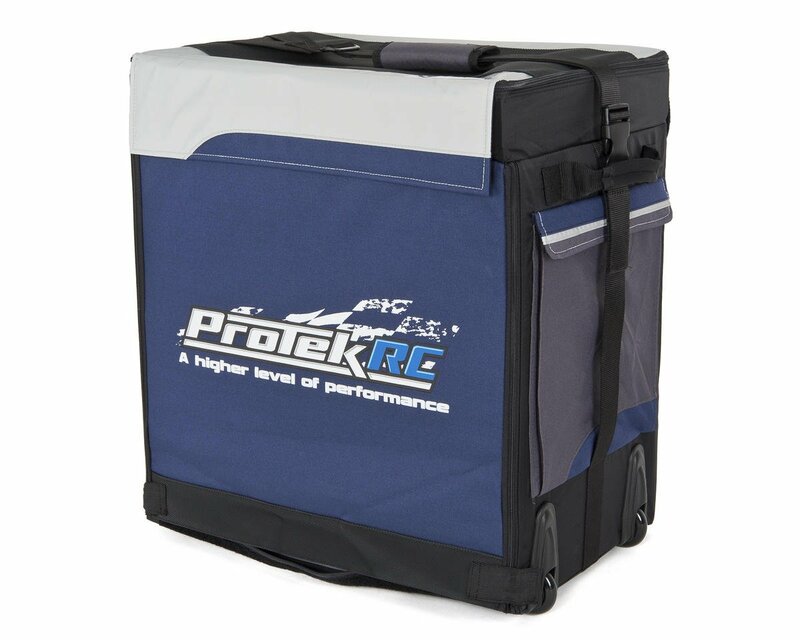 The ProTek R/C P-8 super hauler bag was designed from the ground up for 1/8th scale buggy racers. 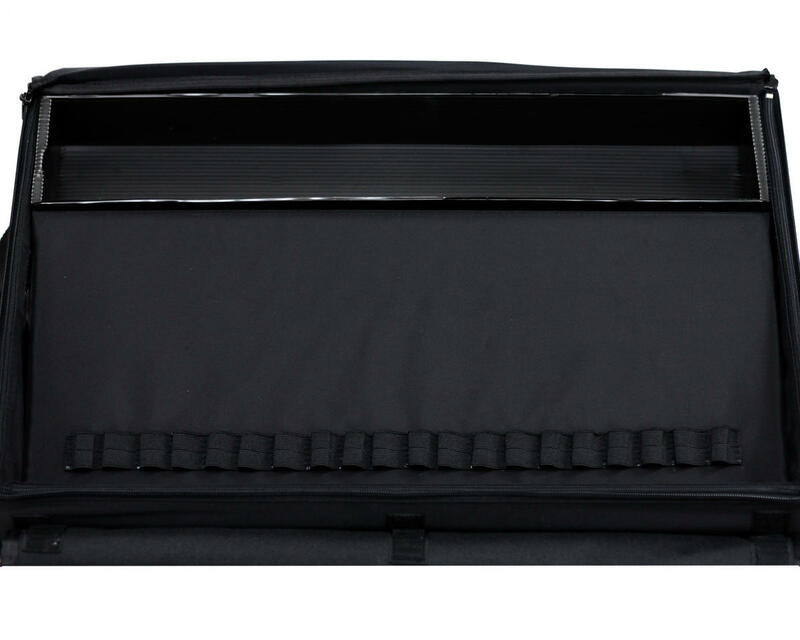 The bag has space on top under a covered flap for storing all your tools, a place on the back for your setup board and storage compartments on the side for storing your setup equipment or other tools. Inside the bag has three layers of drawers, with four split draws on the bottom (two each side by side above each other) and one large drawer on the top. These are the newer style Hauler Bags that have plastic inner boxes. The large drawer on the top is large enough to hold a 1/8th scale buggy with wing and wheels attached! In addition, it is also very easy to tow the bag around the track as it features a heavy duty retractable handle and smooth trolley wheels. 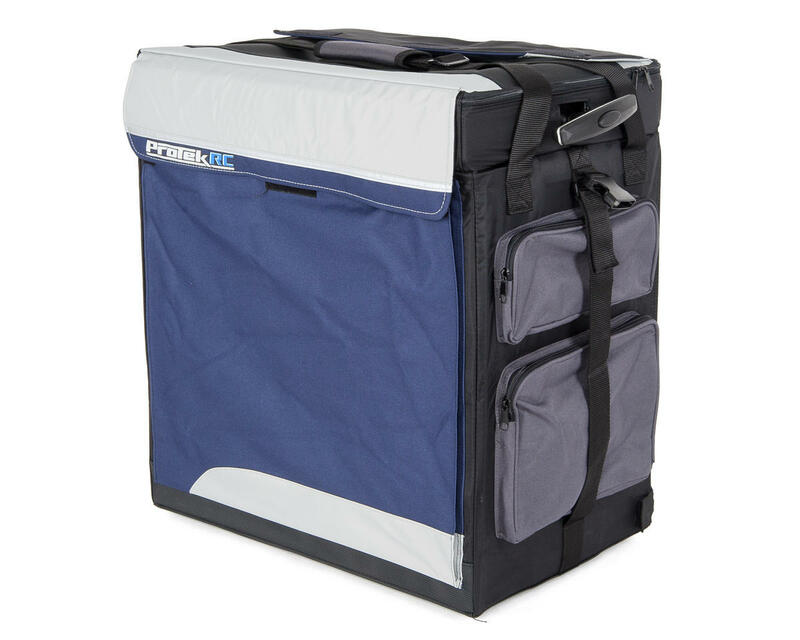 Also included is a carrying strap that can be moved out of the way to access tools in the top compartment, or adjusted to provide easy carrying of the bag. 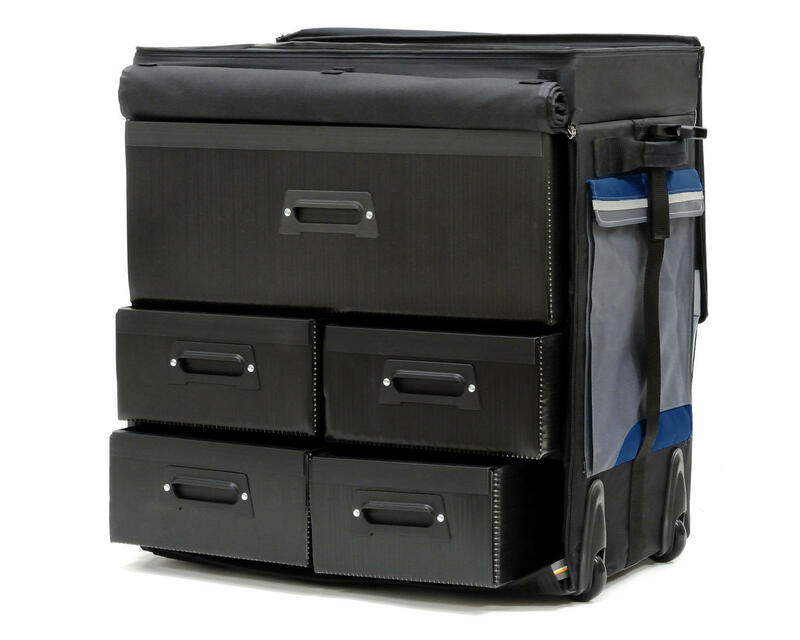 Overall Bag Dimensions (WxHxD): 21.65x23.22x13.77"
Large Drawer Dimensions (WxHxD): 19.5x7.5x12.5"
Medium Drawer Dimensions (WxHxD): 9.5x4.5x12.5"
Small Drawer Dimensions (WxHxD): 8.5x4.5x12.5"
*Dimensions may vary slightly due to manufacturers tolerances. I continue to get compliments and "where'd you get that questions" all the time when I show up to the track with this bag. After a season or so of use and all the compliments figured it was time for a review. Bag is very durable, after a season of wear n tear you can hardly tell it's been out and about racing on over 25 trips. Recommend this bag to anyone who wants most of their gear in one spot - people freak when they see the car is inside the bag too :) You'll have tons of space with this bag and always have all your stuff in one spot! The hauler bag is largel and has plenty of usable space... holds all of my RC stuff with room left over. Although it has a few problems. One of the zipper broke the first week. The second zipper broke after about a month of use. I did not expect it to be this delicate. Dissapointed that the quality was not better..
Been on the fence about this bag for quite some time now. Been through multiple duffle bags, bins, boxes, portable hand trucks.....you name it. I've been searching for custom luggage and bags for RC for years, and always came up short. I have even built my own hauler bag modeled after this one. I just couldn't come to terms with spending $200+ on something that will not make me better or faster at racing. Until reality FINALLY set in. After all the searching and effort trying to find an alternative to this bag it literally cost me well over $200. If you need the motivation to pull the trigger on this bag then consider my testament. After all, it's whats inside the bag that you are heavily invested in. I feel relieved to know that this bag is going to organize and protect all of my bits and pieces and look great in the living room while I'm not at the track. Can you say that about your stack of rubbermaid bins? If so, I'm sure your wife would disagree with you. When I initially got ready to write this review, it was going to be 2 maybe 3 stars. I had the bag for about a week and developed a tear on the front flap of the tool compartment right at the stitching. I was pretty sure I didn't snag it on anything...but you never know. I contacted A-Main and they stepped up immediately and replaced my bag with a new one. Once I contacted them and sent some pics of the damage, the only questions they had was where to send the replacement. They sent a UPS call tag so I wasn't even out any money on the shipping. So, the customer service portion of this is top notch. On to the hauler bag...I really like it. The tool compartment on top is large enough to hold all the tools you need for a day at the track. There's a large flat pocket on the back of the hauler for your setup board. The front flap securing the 5 interior drawers has velcro to hold it up and out of the way at your pit. The drawers are well built and large enough. You could easily fit a 1/10 scale car in the large drawer on the top, 1/8 scale or short course would be a tight fit. But if you're like me and don't haul your cars inside the "hauler" bag, it's a great drawer to put tires in. Construction is top notch, customer service is second to none. This is a duplicate of the Team Magic F8 1/8 bag, and I know as I have both of these. I had my Team Magic for over 5 years and then bought this as it looked the same. When I put it together the drawers were exact and tool tray was exact. Just realize you are getting a Blue Team Magic bag with Protek name on it, and HALF the price. I can easily fit 1/8 buggy with tires and wing in top drawer with other items. This is a great bag and the blue is way better then the orange color. THANKS!! This bag has everything but no CUP HOLDER!!! Not going to lie i was kinda disappointed. This bag is great. I got tired of having to make several trips from my truck to the pits to get everything setup. This bag holds everything except my transmitter case. The construction is top notch. Everything seems very durable. The only downside is I saw a review that said is would hold a short course truck in the top drawer. That has not been the case for me. I tried my TLR22SCT with and without the drawer with no luck. I have not tried my Tekno yet but I don't figure it will work either. That wasn't a huge deal though because I race stadium trucks too saw I just keep it in the top drawer with my tires and strap my short course on top. If you are looking for a good bag to hold everything and make it easy to work out of at the track this is your bag. I was skeptical at first for buying the hauler bag. Let’s face it almost 200.00 bucks is a lot of money with times as bad as they are. When the box was home waiting for me I was surprised at how heavy it was. With assembling the hauler bag I was impressed on the craftsmanship and how heavy duty the plastic walls were and the outer zipper/Velcro pockets. The wheels and mounts are of great strength. Even with the drawers I was thinking they will break and or bend but with the reinforcement of the plastic handle and braces my concerns were no more. It’s great only having one bag to bring to the track where I had to bring three Rubbermaid containers before. So if you’re on the fence, don’t be you won’t regret it! Just purchased the "Version 2" bag. Ordered Sunday night and received it Tuesday. The bag was assembled very smoothly thanks to the instruction manual. The new plastic reinforcements makes this bag much more rigid then other bags i have seen or owned. The drawers open smoothly even with heavy items in them. I would say this is currently the best bag on the market! Nice bag plenty of room for my gear but the straps aren't sewn very good and the plastic handle isn't very strong. Hauler bag is great all around EXCEPT for one minor issue. The two plastic side panels are held at the top with plastic pieces of material to hold the top shelf and stop from sagging. Guess what, one was broke when I received (fell out when I was unboxing) and the other broke after the first week of use. It's a bad design and they use weak material. These pieces are pop riveted to the top plastic shelf. I simply took two pieces of metal right angle and screwed to top shelf. Fixed for good now. Hard to explain but once you see these flimsy pieces you'll know what I'm talking about. I could of returned but would have been no good as the material is just not strong enough. Other than that this bag has been awesome. Stores everything I take to the track and then some. Holds my buggy or short course (without wheels for the truck). Would definitely buy again. Amain emailed me back and is sending me another bag, no questions asked.. That says a lot, they think it was just a bad run or maybe just a faulty zipper. Either way they are taking care of it and I trust that it was just something out of the ordinary. My last review was a little harsh and I wanted to be fair. Amain can't be beat and I will continue to buy all of my stuff from them.. -//- Save your $!!! I ordered this on 3-9-10 and used it about 4 times with 10th scale TC, indoors(not 8th scale buggy) and in that short time the front zipper has ripped over half way up, the top is weak and sags into the top drawer even w/o anything in the top!! I was expecting a lot more for the near $200 I spent on it. I am waiting on amain to get back with me since they own protek so we'll see how that goes. Go with the Team Magic or Racers Edge haulers over this one. Overall the bag is ok, the handle came unsewn when lifting it into my car after only using it for a month of club racing, going back to my ogio bag, when shipped the boxes were damaged, (amain replaces them free of charge) but they won’t cover the handle due to it being out of warranty. Decent enough hauler, was happy with until the handle broke. I was pulling the hauler across the road and it hit a small bump causing it to wobble side to side then completely fell on it side causing the t-handle to snap off in my hand. A proper two-bar handle like airline luggage and other haulers with be much more robust. I use this bag for my 10th scale and it is great! A group of us sit together on race night and we all use the same bag. This is a great bag. I have had it over a year no rips or tears all zippers still working great. So far so good, easy to put together and the quality is insanely good. My only complaint is the drawers are hard to open and close. The rivets and the plastic guide inside is the issue. But I can live with it. This bag is amazing !!! I highly recommend. If anyone is wondering my losi 8ght E 4.0 fits in the top drawer with tires and wing installed. Love it!